Hello everyone ^^ I finally decided to start this new category “Stormy Reviews” where I will talk about K-Dramas, J-dramas and (sometimes) K-Pop MVs. “Stormy” doesn’t mean that I will be trashing everyone on my way… it simply means that I am going to be honest about my point of view. Please comment and let me know if you agree or disagree with me; you can also recommend my “target” for next week. 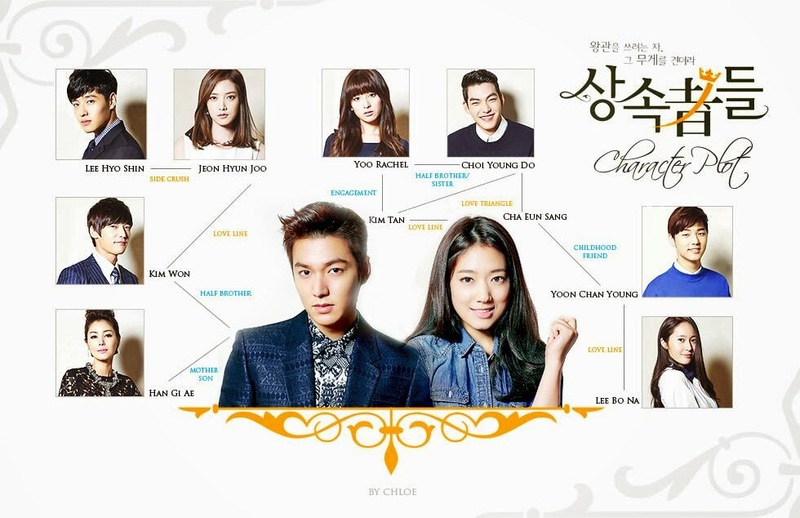 So, first article needs a great subject and what better to review than “The Heirs” !! The story revolves around a young Kim Tan (played by none but the handsome Lee Min Ho… OK, I will try to be unbiased on this review), which is the youngest heir to the big “Empire” Group. Our hero is sent to the USA to complete his studies but also by a mean older brother that tries to keep him away from interfering in the company’s business. On the other side, we have a poor Cha Eun Sang (played by Park Shin Hye) who travels to the USA to meet her older sister before this last one gets married. Once there, our girl discovers that her sister was scamming them (her mother and her) for money, not being on the verge of marriage neither studying (as she was telling them). Our heroes will meet in the USA then, before coming back to South Korea. Life is not easy, Eun Sang has to move in at her mother’s job, being short on money; a job that happens to be a housekeeper at the “Empire” family mansion where Kim tan Lives. Coincidence? It gets better as our tall heir falls in love with the poor girl but needs to fight the resistance of his family and also his so called friends from the upper class. So far, the story seems predictable and boring, a classic K-Drama tale, but it gets better I promise! From the beginning, the episodes take us through what being an heir means: no freedom to do what you want. Anything stupid can turn into tabloids head titles and harm the entire business. Also, there is a certain image to maintain towards other “friends”. The start was difficult for me: too much characters being introduced, too much things and flashbacks happening and I couldn’t get everything from the first glimpse. Luckily, starting from the 3rd episode, everything starts to fall in the right place and I could finally recognize characters and their relationships with each other. Also, I could see where the plot was heading. There are, of course, other twists to the plot: the father of Kim Tan, in an attempt to reduce his son’s interest for the poor girl (clearly not a match for this big family) offers her a scholarship at the same university. He believed that once there, the 2 young students will see for themselves how far apart both words are and let go of their relationship. In this university, we meet Choi Young Do (played by Kim Woo Bin, who is also a supermodel) that instantly falls in love with Eun Sang, while reviving his old rivalry with Kim Tan. Oh Wait… did I tell you that Kim Tan was engaged to another rich heir that was attending the same school? See? Twists I told you ! I loved that! Never ending twists and a suspense that kept me waiting for the next episodes. I also loved the story. It was intertwining and plotted nicely. It got me confused at first but I loved it once a got a nice grip of events. I also liked to see how these kids struggle with their rich lives, but always keeping in mind never to make scandals. In addition, we could see how mean and hurtful they could be in order to get what they wanted; to which extents they could go, no matter who gets hurt on the way. I also loved how each character stayed true to himself. In all previous dramas that I watched, characters would lose what makes them “special” starting from 3rd episode and then laugh about it at the last one: “Remember how you used to…. ?” That was irritating, but not with “The Heirs”. Characters remained the same… they would grow, they would change with the events and learn from their mistakes, but they would stay the same. I also loved how Kim Tan defied everything for his principles. Not caring about scandals and exposing his family’s dirtiest secrets. He was severely punished and yelled at for his actions but he wouldn’t stop until achieving his goals. And that’s a nice lesson to learn. About the actors now: they were amazing! Everyone played his character convincingly. Also, the choice of actors was great. Well, they only chose handsome actors and pretty actresses to do the job J A big part of the drama’s success was the cast. They even included singers. OK, I am still not impressed by Kang Min Heok’s acting. The guy would better stay as a drummer for the time being or take some serious lessons at acting (Boice people, don’t hate me but this is how I feel: I wasn’t impressed at “Heart strings” and I definitely wasn’t here… luckily, he had a relatively small part this time). The OST is the only part that I didn’t like so much. Apart from “I’m saying” by Lee Hong Ki (from FT Island), other songs weren’t memorable…. I can’t even remember if they made Shin Hye or Min Ho sing something there. All in all, this was by far the best drama of 2013. It has all the ingredients for success: an awesome plot, twists, strong unforgettable characters, talented and beautiful actors and the right amount of suspense. Needless to say that it had huge success both in South Korea and internationally. I recommend it for all the K-drama fans.. it’s just a “must” and you should really watch it. For those of you who already did, please let me know if you share my opinion, or let me know what you thought of it. (Sorry for the long review… I still have more things to say but it would make this article utterly boring. I will try to make shorter reviews next time ^^).